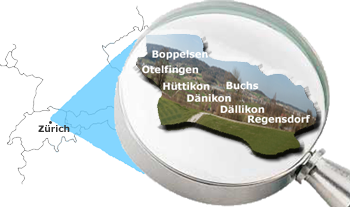 Our eastern and western boundaries are defined by the cities, Regensdorf in the east and Würenlos in the west. Here in Würenlos one finds the Furtbach, a small tributary that has given our region its name. It continues westward to merge with the river Limmat. Nature and open rural spaces still prevail in our region despite the intense urbanization in recent years. The hilly ridges of mount Lägern in the north and mount Altberg in the south offer a dense forest and a diversified natural environment. Undoubtedly, those who seek an environment to relax and enjoy culture, the Furttal region will find what he is looking for as it offers many reasons to enjoy and appreciate the region.